Grace. We've been talking about that a lot here as we discuss discipling and disciplining our children, haven't we? And inevitably, whenever I write about parenting with grace or living with a gospel-centered perspective, I get questions from you that ask, "But what does that look like?" I want to give you nothing but hope and Truth. I'm not the only one (thank you, Jesus!) There are moms and dads who have been at this even longer than we have, with more wisdom, more experience, and tender kind hearts to touch you in your corner of the world. 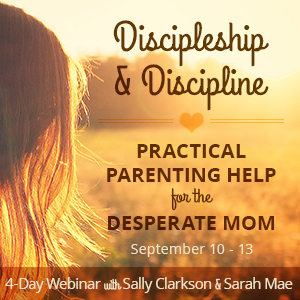 This week, veteran homeschooler Sally Clarkson and gracious blogger Sarah Mae are teaming up to bring you a 4-day webinar called Discipleship and Discipline that starts tomorrow, September 10th. I wouldn't hesitate one tiny bit to recommend this to you. Sometimes I cringe when I see what's out there on the topic of parenting, but Sally and Sarah Mae are going to point you back to Jesus and remind you where your worth and value lie. They're going to cover the practical stuff (tricky kids, respect, goals) and share their own personal journeys. You'll even have the opportunity to ask them questions at the end of the course. What author can offer you that? Gosh, I love the resources God gives us via the internet. I am an affiliate for the Discipleship and Discipline eCourse, and don't do that for anything I don't believe in and/or use myself. Period. Need parenting help? Go get it, girl!